Ann Arbor (Informed Comment) – Ilhan Omar (D-MN) grilled Elliot Abrams yesterday, holding his feet to the fire about his having lied to Congress (to two counts of which which he pleaded guilty) and about his support for far right wing forces in Central America responsible for massacres (forces Abrams characterizes as “democratic,” confusing oppressive elite hegemony with rule of the people). Omar as a Somali refugee has strong views about the history of US imperial interventions in and destabilization of countries of the global South. That sort of seasoned anti-imperialism grounded in hard personal experience is almost never voiced in the halls of Congress. But on the face of it, it is hardly alien to the American experience. Mark Twain was scathing on the US invasion of the Philippines (a cruel and disastrous episode actively celebrated by the Neoconservatives). It is now hard to remember that “empire” was a dirty word to Americans, proud of their egalitarian republicanism, right up until the Federal government went imperial in 1898. Abrams in contrast glories in empire, having been part of the Project for a New American Century that plotted out our current Forever Quagmire and still cannot see it for the white elephant it is. Abrams’ ability to hold high office and help shape US government policy despite decades of duplicity and complicity in the worst war crimes– including the Iraq War, which killed hundreds of thousands and displaced 4 million and destabilized the region, and ongoing crimes against humanity in Occupied Palestine– tells you all you need to know about how truly corrupt the American political establishment is. When George W. Bush brought Abrams back into government I was shocked. I asked a congressman I knew how Congress had ever allowed such a thing, since everyone on the Hill in the late ’80s had sworn they’d never allow Abrams to hold high office ever again. The congressman said ruefully that there had been so much turnover that many on the Hill by 2004 didn’t any longer know who Abrams was or that he had pleaded guilty to lying to Congress. We are governed in a fit of absent-mindedness. Abrams complained when Rep. Omar began by pointing out that he had been convicted of lying to Congress, because she said it was not a question and did not let him respond. He pleaded guilty to the charge. He was strongly censured for it by the Appeals Court of Washington, DC. I mean, he is a bent lawyer that the Better Business Bureau couldn’t recommend to clients, but he gets to tell the Venezuelan people how they will be governed. Let’s just review the legal case against Abrams. The Congressional Boland Amendment of 1982 tried to stop Reagan from assisting the Contras militarily or in any other way. The Iran-Contra Crooks decided to get around that prohibition by raising money overseas. Fundraising outside the government was permitted in a 1986 amendment, but not for arms. The Iran-Contra Crime Gang of which Abrams was a part raised money for Contra guns in three main ways. One was that they did fundraising with conservative Muslim states that opposed the international Left. So they got money from high Saudi officials via Adnan Khashoggi, an arms dealer, and they also got money from Brunei. The second was that they sold $100 million of US arms through intermediaries, including Israelis, to Ayatollah Khomeini of Iran. These sales were illegal and unconstitutional and involve abetting a designated terrorist state. The third is harder to prove, but there is substantial evidence that the Gang encouraged the Contras to engage in drug smuggling so as to raise money to buy their own arms. The drugs were sold at least in part in the United States. It is hard to know how much to read into the document, but one exists showing that Abrams sent $300,000 to a known American drug smuggler in Miami to fly “supplies” (arms?) to the Contras, and presumably to ferry drugs back out, though that hasn’t been proved. Also, Abrams personally went and lobbied the Sultan of Brunei for $10 million, which he received. He gave the bank number to Col. Oliver North, the conspirator in chief, so that he could send the money to the Contras, but North is such a sad sack screw-up that he actually wired the $10 million to the wrong Swiss Bank account. After the events of 1985-89, Abrams was pardoned by George H. W. Bush. He was however forbidden to practice law for one year, given that he is a big fat liar. He appealed that ruling on the grounds that his pardon should have erased the crime. A panel of judges on the DC Court of Appeals found that the pardon did most certainly not erase the crime, but there was one judge who was disinclined to discipline Abrams, so the others made do with issuing him a severe censure. It is sort of like, if Abrams owned a toaster factory and you needed a toaster, they were warning you not to buy a toaster from him because his toasters use substandard materials and will burn you because he is corrupt. “On October 5, 1986, an American aircraft which was carrying supplies to the Contras was shot down over Nicaragua. The downing of the plane, and the capture of its pilot, led to public allegations that notwithstanding the Boland Amendment, the government was continuing to arm and otherwise assist the Contras. As a result, Abrams was called to appear before several Congressional committees to explain the government’s position. I think that people who are supplying the Contras believe that we generally approve of what they are doing-and they are right. We do generally approve of what they are doing, because they are keeping the Contras alive while Congress makes its decision, which each House has separately, though obviously final legislation is not yet ready. So, the notion that we are generally in favor of people helping the Contras is correct. “At the time Abrams so testified, he knew that Lieutenant Colonel Oliver North had engaged in conversations with people who were supplying the Contras, and that North had asked and encouraged these people to supply the Contras. Abrams concealed from the Senate Committee his knowledge of these conversations and of North’s support for and coordination of the assistance being provided to the Contras. “[THE CHAIRMAN]: Do you know if any foreign government is helping to supply the Contras? There is a report in the L.A. paper, for example, that the Saudis are. [MR. GEORGE]:  No sir, we have no intelligence of that. [MR. ABRAMS]: I can only speak on that question for the last fifteen months when I have been in this job, and that story about the Saudis to my knowledge is false. I personally cannot tell you about pre-1985, but in 1985-1986, when I have been around, no. [THE CHAIRMAN]: Is it also false with respect to other governments as well? “(Emphasis in information.) In fact, Abrams had personally met with a representative of the Sultan of Brunei to solicit the Sultan’s assistance, and he was aware that the Sultan had agreed to provide ten million dollars to the Contras. Abrams had also provided the Sultan’s representative with a Swiss bank account number so that funds for the Contras could be deposited into that account. Did Abrams know about the North arms sales to Khomeini? Was he involved personally? Did he lend material assistance to a terrorist regime? Did he facilitate Contra drug smuggling? Did he turn a blind eye to the atrocities committed by the Contra death squads and by the far rightwing government of El Salvador? What we do know is that Abrams lied with the specific intent of hiding from Congress massive violations of the Boland Amendment. 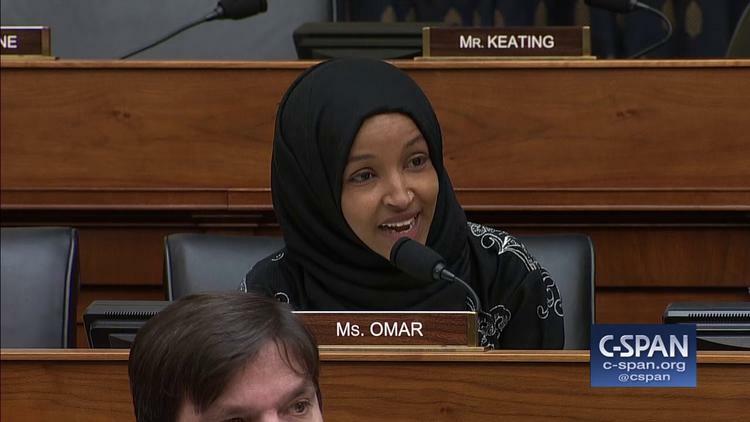 I don’t know what he was going to say to Ilhan Omar in response to her having rebuked him for the lying. Whatever it was would almost certainly have been more lies.